"Indian Wars" redirects here. For wars fought by India, see List of wars involving India. 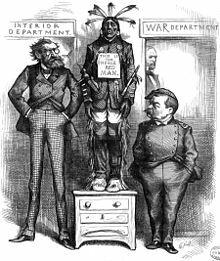 In several instances, warfare in America was a reflection of European rivalries, with American Indian tribes splitting their alliances among the powers, generally siding with their trading partners. Various tribes fought on each side in King William's War, Queen Anne's War, Dummer's War, King George's War, and the French and Indian War, allying with British or French colonists according to their own self interests. Similarly, Indian tribes differed in their alliances during the American Revolution and the War of 1812. The Cherokees supported the British in the Revolutionary War and raided frontier American settlements in the hope of driving out the settlers, and four Iroquois tribes fought against the Patriots. Other tribes fought for the American Patriots, such as the Oneida people and Tuscarora people of the Iroquois Confederacy in New York. Many refugees from defeated tribes went over the border to Canada; those in the South went to Florida while it was under Spanish control. During the early 19th century, the federal government was under pressure by settlers in many regions to expel Indians from their areas. The Indian Removal Act of 1830 offered Indians the choices of assimilating and giving up tribal membership, relocation to an Indian reservation with an exchange or payment for lands, or moving west. Some resisted fiercely, most notably the Seminoles in a series of wars in Florida. They were never defeated, although some Seminoles did remove to Indian Territory. The United States gave up on the remainder, by then living defensively deep in the swamps and Everglades. Others were moved to reservations west of the Mississippi River, most famously the Cherokee whose relocation was called the "Trail of Tears." The American Revolutionary War was essentially two parallel wars for the American Patriots. The war in the east was a struggle against British rule, while the war in the west was an "Indian War". The newly proclaimed United States competed with the British for control of the territory east of the Mississippi River. 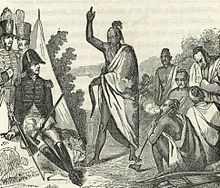 Some Indians sided with the British, as they hoped to reduce American settlement and expansion. In one writer's opinion, the Revolutionary War was "the most extensive and destructive" Indian war in United States history. The frontier conflicts were almost non-stop, beginning with Cherokee involvement in the American Revolutionary War and continuing through late 1794. The so-called "Chickamauga Cherokee", later called "Lower Cherokee," were from the Overhill Towns and later from the Lower Towns, Valley Towns, and Middle Towns. They followed war leader Dragging Canoe southwest, first to the Chickamauga Creek area near Chattanooga, Tennessee, then to the Five Lower Towns where they were joined by groups of Muskogee, white Tories, runaway slaves, and renegade Chickasaw, as well as by more than a hundred Shawnee. The primary targets of attack were the Washington District colonies along the Watauga, Holston, and Nolichucky Rivers, and in Carter's Valley in upper eastern Tennessee, as well as the settlements along the Cumberland River beginning with Fort Nashborough in 1780, even into Kentucky, plus against the Franklin settlements, and later states of Virginia, North Carolina, South Carolina, and Georgia. The scope of attacks by the Chickamauga and their allies ranged from quick raids by small war parties to large campaigns by four or five hundred warriors, and once more than a thousand. The Upper Muskogee under Dragging Canoe's close ally Alexander McGillivray frequently joined their campaigns and also operated separately, and the settlements on the Cumberland came under attack from the Chickasaw, Shawnee from the north, and Delaware. Campaigns by Dragging Canoe and his successor John Watts were frequently conducted in conjunction with campaigns in the Northwest Territory. 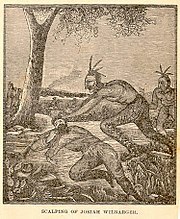 The colonists generally responded with attacks in which Cherokee settlements were completely destroyed, though usually without great loss of life on either side. The wars continued until the Treaty of Tellico Blockhouse in November 1794. In 1787, the Northwest Ordinance officially organized the Northwest Territory for settlement, and American settlers began pouring into the region. Violence erupted as Indian tribes resisted, and so the administration of President George Washington sent armed expeditions into the area. However, in the Northwest Indian War, a pan-tribal confederacy led by Blue Jacket (Shawnee), Little Turtle (Miami), Buckongahelas (Lenape), and Egushawa (Ottawa) defeated armies led by Generals Josiah Harmar and Arthur St. Clair. General St. Clair's defeat was the most severe loss ever inflicted upon an American army by Indians. The Americans attempted to negotiate a settlement, but Blue Jacket and the Shawnee-led confederacy insisted on a boundary line that the Americans found unacceptable, and so a new expedition was dispatched led by General Anthony Wayne. Wayne's army defeated the Indian confederacy at the Battle of Fallen Timbers in 1794. The Indians had hoped for British assistance; when that was not forthcoming, they were compelled to sign the Treaty of Greenville in 1795, which ceded Ohio and part of Indiana to the United States. By 1800, the Indian population was approximately 600,000 in the continental United States. By 1890, their population had declined to about 250,000. In 1800, William Henry Harrison became governor of the Indiana Territory, under the direction of President Thomas Jefferson, and he pursued an aggressive policy of obtaining titles to Indian lands. 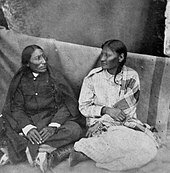 Shawnee brothers Tecumseh and Tenskwatawa organized Tecumseh's War, another pan-tribal resistance to westward settlement. Tecumseh was in the South attempting to recruit allies among the Creeks, Cherokees, and Choctaws when Harrison marched against the Indian confederacy, defeating Tenskwatawa and his followers at the Battle of Tippecanoe in 1811. The Americans hoped that the victory would end the militant resistance, but Tecumseh instead chose to ally openly with the British, who were soon at war with the Americans in the War of 1812. The Creek War (1813–14) began as a tribal conflict within the Creek tribe, but it became part of the larger struggle against American expansion. 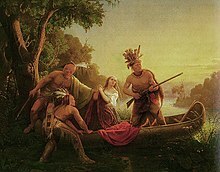 Tecumseh was killed by Harrison's army at the Battle of the Thames, ending the resistance in the Old Northwest. The First Seminole War in 1818 resulted in the transfer of Florida from Spain to the United States in 1819. American settlers began to push into Florida, which was now an American territory and had some of the most fertile lands in the nation. Paul Hoffman claims that covetousness, racism, and "self-defense" against Indian raids played a major part in the settlers' determination to "rid Florida of Indians once and for all". To compound the tension, runaway black slaves sometimes found refuge in Seminole camps, and the result was clashes between white settlers and the Indians residing there. Andrew Jackson sought to alleviate this problem by signing the Indian Removal Act, which stipulated the relocation of Indians out of Florida—by force if necessary. The Seminoles were relatively new arrivals in Florida, led by such powerful leaders as Aripeka (Sam Jones), Micanopy, and Osceola, and they had no intention of leaving their new lands. They retaliated against the settlers, and this led to the Second Seminole War, the longest and most costly war that the Army ever waged against Indians. In May 1830, the Indian Removal Act was passed by Congress which stipulated forced removal of Indians to Oklahoma. The Treaty of Paynes Landing was signed in May 1832 by a few Seminole chiefs who later recanted, claiming that they were tricked or forced to sign and making it clear that they would not consent to relocating to a reservation out west. The Seminoles' continued resistance to relocation led Florida to prepare for war. The St. Augustine Militia asked the US War Department for the loan of 500 muskets, and 500 volunteers were mobilized under Brig. Gen. Richard K. Call. Indian war parties raided farms and settlements, and families fled to forts or large towns, or out of the territory altogether. A war party led by Osceola captured a Florida militia supply train, killing eight of its guards and wounding six others; most of the goods taken were recovered by the militia in another fight a few days later. Sugar plantations were destroyed along the Atlantic coast south of St. Augustine, Florida, with many of the slaves on the plantations joining the Seminoles. The US Army had 11 companies (about 550 soldiers) stationed in Florida. Fort King (Ocala) had only one company of soldiers, and it was feared that they might be overrun by the Seminoles. Three companies were stationed at Fort Brooke (Tampa), with another two expected imminently, so the army decided to send two companies to Fort King. On December 23, 1835, the two companies totaling 110 men left Fort Brooke under the command of Major Francis L. Dade. Seminoles shadowed the marching soldiers for five days, and they ambushed them and wiped out the command on December 28. Only three men survived, and one was hunted down and killed by a Seminole the next day. Survivors Ransome Clarke and Joseph Sprague returned to Fort Brooke. Clarke died of his wounds later, and he provided the only account of the battle from the army's perspective. The Seminoles lost three men and five wounded. On the same day as the massacre, Osceola and his followers shot and killed Agent Wiley Thompson and six others during an ambush outside of Fort King. In the Battle of Lake Okeechobee, Colonel Zachary Taylor saw the first major action of the campaign. He left Fort Gardiner on the upper Kissimmee River with 1,000 men on December 19 and headed towards Lake Okeechobee. In the first two days, 90 Seminoles surrendered. On the third day, Taylor stopped to build Fort Basinger where he left his sick and enough men to guard the Seminoles who had surrendered. Taylor's column caught up with the main body of the Seminoles on the north shore of Lake Okeechobee on December 25. 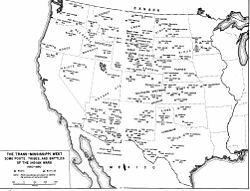 The region that became the western United States had been penetrated by U.S. forces and settlers before this period, notably by fur trappers, the Santa Fe Trail, the Oregon Trail, and the Mormon emigration to Utah, as well as by settlement of California and Oregon. Relations were generally peaceful between American settlers and Indians. In the case of the Santa Fe Trail, this was due to the friendly relationship of the Bents of Bent's Fort with the Cheyenne and Arapaho and, in the case of the Oregon Trail, to the peace established by the Treaty of Fort Laramie signed in 1851 between the United States and the Plains Indians and the Indians of the northern Rocky Mountains. The treaty allowed passage by settlers, building roads, and stationing troops along the Oregon Trail. The Pike's Peak Gold Rush of 1859 introduced a substantial white population into the Front Range of the Rockies, supported by a trading lifeline that crossed the central Great Plains. Advancing settlement following the passage of the Homestead Act and the building of the transcontinental railways following the Civil War further destabilized the situation, placing white settlers into direct competition for the land and resources of the Great Plains and the Rocky Mountain West. 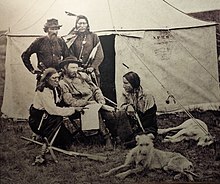 Further factors included discovery of gold in the Black Hills resulting in the gold rush of 1875–1878, and in Montana during the Montana Gold Rush of 1862–1863 and the opening of the Bozeman Trail, which led to Red Cloud's War and later the Great Sioux War of 1876–77. 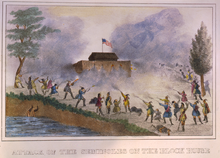 The first notable battle was the Fort Parker massacre in 1836, in which a huge war party of Comanches, Kiowa, Wichitas, and Delawares attacked the Texan outpost at Fort Parker. 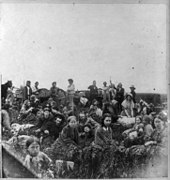 A small number of white settlers were killed during the raid, and the abduction of Cynthia Ann Parker and two other children caused widespread outrage among Texas' Anglo settlers. Once the Republic of Texas was declared and had secured some sovereignty in their war with Mexico, the Texas government under President Sam Houston pursued a policy of engagement with the Comanches and Kiowa. Ironically, since Houston had lived with the Cherokee, the republic faced a conflict called the Cordova Rebellion, in which Cherokees appear to have joined with Mexican forces to fight the fledgling country. Houston resolved the conflict without resorting to arms, refusing to believe that the Cherokee would take up arms against his government. The administration of Mirabeau B. Lamar, which followed Houston's, took a very different policy towards the Indians. Under Lamar, Texas removed the Cherokee to the west, and then sought to deport the Comanche and Kiowa. This led to a series of battles, including the Council House Fight, in which, at a peace parley, the Texas militia killed 33 Comanche chiefs. The Comanche retaliated with the Great Raid of 1840, and the Battle of Plum Creek followed several days later. Because of the small U.S. Army garrison west of the Rockies, and the economic and political effects of the California Gold Rush, most of the early conflicts with the mostly unwarlike California Indians involved local parties of miners or settlers. Occasionally companies of the California Militia were involved, whose actions were dignified with the name of an "Expedition" or a "War". The first of these, the Gila Expedition in 1850, was a dismal failure and nearly bankrupted the state. Initially relations between participants in the Pike's Peak gold rush and the Native American tribes of the Front Range and the Platte valley were friendly. An attempt was made to resolve conflicts by negotiation of the Treaty of Fort Wise, which established a reservation in southeastern Colorado, but the settlement was not agreed to by all of the roving warriors, particularly the Dog Soldiers. During the early 1860s tensions increased and culminated in the Colorado War and the Sand Creek Massacre, where Colorado volunteers fell on a peaceful Cheyenne village killing women and children, which set the stage for further conflict. After the Civil War, all of the Indians were assigned to reservations; the role of the army was to keep them there. The reservations themselves were under the control of the Interior Department. Control of the Great Plains fell under the Army's Department of the Missouri, an administrative area of over 1,000,000 mi2, encompassing all land between the Mississippi River and the Rocky Mountains. Maj. Gen. Winfield S. Hancock had led the department in 1866, but had mishandled his campaign, resulting in Sioux and Cheyenne raids that attacked mail stagecoaches, burnt the stations, and killed the employees. They also raped, killed, and kidnapped many settlers on the frontier. Sheridan attempted to improve the conditions of the military outpost and the Indians on the plains through a peace-oriented strategy. Toward the beginning of his command members of the Cheyenne and Arapaho followed him on his travels from Fort Larned to Fort Dodge where he spoke to them. They brought their problems to Sheridan's ear and explained how the supplies they were promised by the commissioners were not being delivered. In response Sheridan gave the starving Natives a generous supply of rations. Shortly thereafter, the Saline Valley settlements were attacked and were followed by other violent raids and kidnappings in the region. Sheridan wanted to respond in force but was constrained by the government's peace police and the lack of well supplied mounted troops. Since he could not deploy official military units, Sheridan commissioned a group of 47 frontiersmen and sharpshooters called Solomon's Avengers. They investigated the recent raids near Arickaree Creek and were attacked by Native Indians on September 17 of 1868. The battle now known as Beecher's Island saw the Avengers under siege for eight days by some by seven hundred Indian warriors. Using their Spencer repeaters they were able to keep them at bay until military units arrived to help. The Avengers lost six men and another 15 were wounded. Due to the increase of violent attacks like Beecher's Island and Saline Valley, Sherman gave Sheridan authority to respond in force to these threats. During his lifetime Sheridan was known as a fierce enemy of the Indians, and his approach to the Indians were encapsulated when he is thought to have said "The only good Indian is a dead Indian", although he himself denied having said this when criticized by his political opponents. Sheridan believed that his soldiers would be unable to contend or chase the horses of the Natives during the summer months and decided to use them as a defensive force the remainder of September and October. His forces were better fed and clothed than the natives and in the winter months when they were constricted to winter camps, his forces could launch a successful campaign. His Winter Campaign of 1868 would start with the 19th Kansas from Custer's 7th Cavalry along with 5 battalions of infantry under Major John H Page setting out from Fort Dodge on November 5. A few days later a force from the East consisting of units of the 5th Cavalry along with two companies of infantry moved from Fort Bascom to Fort Cobb where they would meet up with units from the 3rd Cavalry leaving from Fort Lyon. Sheridan Directed the opening month of the campaign from Camp Supply. The Units from the 5th and 3rd Cavalry would meet at Fort Cobb without any sign of the 19th Kansas, but they had a lead on a band of Indians nearby and Custer would lead a force after them. The coming attack by Custer on the Cheyenne Indians and Black Kettle would come to be known as the Battle of Washita River. 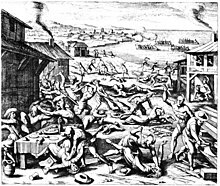 During Custer's attack it is estimated over 100 Indians were killed and over 50 taken prisoner. For Custer's forces two officers and nineteen men were killed, two officers and eleven men wounded, and a unit under Major Elliott's command had gone missing. After the battle Custer would execute 675 ponies which were imperative to the native's survival on the plains. At this time the 19th Kansas were found and made their way into Camp Supply. Immediately following the battle, Sheridan received large amounts of backlash from Washington politicians who defended Black Kettle as a peace-loving Indian. This began the controversy arose as to whether the event was best described as a military victory or as a massacre. This discussion endures among historians to this day. With his successful campaign coming to a close Sheridan was called back to Washington following the election of President Grant. He was informed on his promotion to lieutenant general of the army and reassigned from the department. With his campaign not yet complete Sheridan protested and was allowed to stay in Missouri with the rank of lieutenant general. The last remnants of Indian resistance came from Tall Bull Dog Soldiers and elements of the Sioux and Northern Cheyenne tribes. The 5th Cavalry from Fort McPherson were sent to handle the Situation on the Platte River in Nebraska. In May the two forces collided at Summit Springs and the Natives were pursued out of the region. This brought the end to Sheridan's campaign as the Indians had successfully been removed from the Platte and Arkansas and the majority of those in Kansas had been settled onto reservations. Sheridan would leave in 1869 to take command of the Army and was replaced by Major General Schofield. This was not the end of the wars but the beginning of a war of attrition. In 1875, the Great Sioux War of 1876–77, the last serious Sioux war erupted, when the Dakota gold rush penetrated the Black Hills. The U.S. Government decided to stop evicting trespassers from the Black Hills, and offered to buy the land from the Sioux. When they refused, the Government decided instead to take the land, and gave the Lakota until January 31, 1876 to return to reservations. With the deadline's passing, the tribes were absent from the reservations, and military action commenced. After several indecisive encounters, Lt. Colonel George Custer found the main encampment of the Lakota and their allies at the Battle of the Little Bighorn. Custer and his men—who were separated from their main body of troops—were all killed by the far more numerous Indians who had the tactical advantage. They were led in the field by Crazy Horse and inspired by Sitting Bull's earlier vision of victory. The defeat of Custer and his troopers as a popularized episode in the history of western Indian warfare was fostered by an advertising campaign by the Anheuser-Busch brewery. The enterprising company ordered reprints of a dramatic painting that depicted "Custer's Last Fight" and had them framed and hung in many American saloons, helping to create lasting impressions of the battle and the brewery's products in the minds of bar patrons. Later, in 1890, a Ghost Dance ritual on the Northern Lakota reservation at Wounded Knee, South Dakota, led to the Army's attempt to subdue the Lakota. 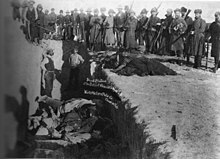 On December 29 during this attempt, gunfire erupted, and soldiers killed up to 300 Indians, mostly old men, women and children in the Wounded Knee Massacre. Following the massacre, author L. Frank Baum wrote: "The Pioneer has before declared that our only safety depends upon the total extermination of the Indians. Having wronged them for centuries, we had better, in order to protect our civilization, follow it up by one more wrong and wipe these untamed and untamable creatures from the face of the earth." Long before this, the means of subsistence and the societies of the indigenous population of the Great Plains had been destroyed by the slaughter of the buffalo, driven almost to extinction in the 1880s by indiscriminate hunting. According to historian David Rich Lewis, American popular histories, film, and fiction have given enormous emphasis to the Indian wars. New ethno-historical approaches became popular in the 1970s which mixed anthropology with historical research in hopes of gaining a deeper understanding of the Indian perspective. During the 1980s, human rights abuses by the US government were increasingly studied by historians exploring the impact of the wars on Indian cultures. Prior to this, popular history was heavily influenced by Dee Brown's non-academic treatment of historical events in Bury My Heart at Wounded Knee (1970). In more academic history, Francis Jennings's The Invasion of America: Indians, Colonialism, and the Cant of Conquest (New York: Norton, 1975) was notable for making strong attacks against the Puritans and rejecting the traditional portrayal of the wars between the Indians and colonists. ^ Church, Thomas R. (January 2015). Operational Art in Pontiac's War (PDF). Defense Technical Information Center. School of Advanced Military Studies. United States Army Command and General Staff College. Retrieved 7 November 2018. ^ Section on the Bozeman Trail "Winning the West the Army in the Indian Wars, 1865–1890"
^ Krenek, Thomas H. "Sam Houston". Handbook of Texas Online. Texas State Historical Association. Retrieved 2007-11-11. ^ ''Northwestern Bands of Shoshone Indians v. United States United States Supreme Court, April 9, 1945, 89 L.Ed. 985; 65 S.Ct. 690; 324 U.S. 335. ^ "The Diary of Lamech Chambers". Nrchambers.tripod.com. Retrieved 2011-05-28. ^ "CWSAC Battle Summary: Sand Creek". National Park Service. Retrieved February 8, 2010. ^ "Community – Diversity". Anheuser-Busch. Retrieved 2011-05-28. ^ "10th Cavalry Squadron History". US Army. Archived from the original on 2005-04-19. ^ United States Census Bureau (March 2011). "Overview of Race and Hispanic Origin: 2010" (PDF). Retrieved 6 July 2012. ^ Statistics Canada (September 2013). "NHS Profile, Canada, 2011". Retrieved 11 September 2013. ^ Snow, Dean R. (June 16, 1995). "Microchronology and Demographic Evidence Relating to the Size of Pre-Columbian North American Indian Populations". Science. 268 (5217): 1601–1604. doi:10.1126/science.268.5217.1601. ^ Lord, Lewis (1997). "How Many People Were Here Before Columbus?" (PDF). U.S. News & World Report. "Named Campaigns: Indian Wars". United States Army Center of Military History. Retrieved 2005-12-13. Kip, Lawrence (1859). Army life on the Pacific : a journal of the expedition against the northern Indians, the tribes of the Cour d'Alenes, Spokans, and Pelouzes, in the summer of 1858. Redfield. ISBN 978-0-548-50401-7. Available online through the Washington State Library's Classics in Washington History collection.